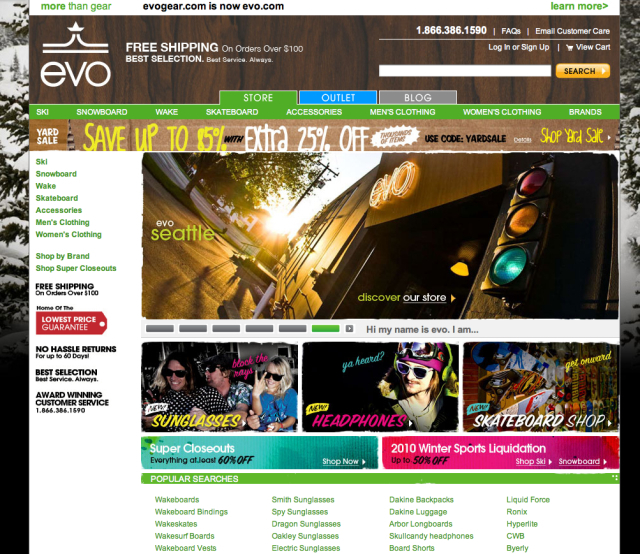 SEATTLE, WASHINGTON – evo, a leading multi channel, action sports retailer of skis, snowboards, skateboards, wakeboards, accessories, footwear and apparel, is evolving its name from evogear.com to evo.com! Same ol’ evo, but with a shiny new place to call home. The switch is significant for the Company and its customers, and is considered a big win from several perspectives such as allowing the Company to continue growing under one single unified brand name. “evo has always been our name and speaks much more accurately to the business and activities that we represent, both now, and going forward, because it’s broad and isn’t pinned to what most people think of when they hear ‘gear’.’ The Company’s name, ‘evo’,is rooted in the word “evolution”. It describes the way we view the business from an operational and philosophical perspective knowing that there’s always a better way to do things. It also speaks to the products we sell, in that they are always changing, progressing, meeting the needs and desires of the evolving consumer.” explains evo founder, Bryce Phillips. evo is much more than providing the latest in gear and apparel for the sports it represents. The Company is rooted in a deep, authentic passion for, and knowledge of the product, culture and lifestyle of action sports. evo is unique in that the Company engages the community at a deeper level through events such as art openings, film premiers, and skate competitions. It’s also known as a weekly “gathering place” for customers and employees to meet, ride up to the mountains, and enjoy a day on the hill together. “evo is focused on much more than the transaction because we participate in an industry that we personally love and the sports that inspire us.”, says Phillips. Catering to a devoted community, evo carries a broad assortment of gear, apparel and accessories from top brands such as K2, Burton, Line Skis, Volkl, Ronix, Dakine, Arc’teryx, and WESC. So, what happens to evogear.com? Same as with a Post Office Change of Address, visitors will get redirected to the new address, evo.com. evo explores the collaboration between culture and sport by seamlessly joining fashion, music, art, and sport. Through our unique events, movie premiers, art exhibitions, and partnerships we are simply providing a venue to share what we love. Passion for building community is a driving force; both on a national level and locally in Seattle.